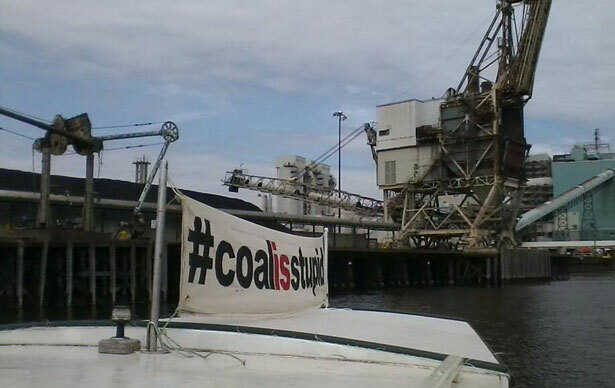 In a lobster boat, two climate activists put themselves in the path of a Massachusetts coal tanker, demanding the immediate closure of the largest coal plant in the Northeast. An update on the day's outcome appears below. It seems fitting that this would be my first post here, given the subject of my first piece for The Nation, on the cover of the current issue. Near the end of that essay, I write that it’s time for climate activists “to say and do ‘crazy’ and ‘radical’ things,” such as “put their bodies in the way of coal shipments.” I didn’t know I’d be writing this post when I wrote those words, but this morning, that is precisely what’s happened. At around 9:30 am, two climate activists I know through 350 Massachusetts anchored an old wooden lobster boat, the Henry David T. (I like the name), in the path of a coal tanker—putting their bodies in the way of a shipment to the Brayton Point coal-fired power plant in Somerset, Massachusetts, the largest fossil-fueled plant and largest source of carbon emissions in the Northeast. They’re calling for the plant to be shut down—immediately—for the sake of the climate and all of us. Of course there’s already an effort underway, led by the Coal Free Massachusetts coalition, to close Brayton Point—by 2020. But Ken and Jay are saying that if we actually take the threat of catastrophic climate change seriously, based on the science, 2020 isn’t anywhere near soon enough. We’ve run out of time. We should have closed it down long ago. We are doing exactly the opposite…. If Dominion Resources sells Brayton Point—the single largest source of coal emissions in the Northeast—to Energy Capital Partners, the likelihood that this plant will continue operation is substantially strengthened…. Yet Brayton Point should be shut down immediately—and by “immediately,” we mean today—for more than one reason. First, every day of additional emissions is a terrible, immoral imposition on our children and, in ways we do not fully understand, on the other living things of God’s creation. Second, we do not need this power plant—efficiency measures alone can reduce demand by far more than the 6% of Massachusetts electricity generation supplied by the plant. Third, in order for the US to exert global leadership on climate, we must take decisive and difficult steps in the right direction for our own nation. The closure of all US coal plants, coupled with the sort of vigorous advancement of efficiencies and renewables that is much talked about but little acted upon, would create the political and moral basis for effective global leadership by the US, without which no global solution is possible. We are faced with an imperative like none confronted by any previous generation; we are living in a society that is disavows responsibility for this greatest of crises, and lacks any process or means by which decisions, like that to extend the life of Brayton Point, might be affected. It is our choice to take direct, non-violent action—putting our bodies between the Brayton Point coal plant and its water-borne coal supply—in an attempt to achieve the outcome necessary for planetary survival; the immediate closure of Brayton Point Power Station. This morning, Ken and Jay, with the help of friends from 350 New Jersey, delivered a letter to Dominion and its proposed buyer, Energy Capital Partners, cc’d to Governor Deval Patrick of Massachusetts, explaining why the sale should not be allowed and the plant should be closed. At a little before noon, Ken and Jay were taken into Coast Guard custody. The fate of the Henry David T. remained unknown. Here’s to Ken and Jay: “crazy,” “radical”—and right. Update (7:40pm ET Wednesday): Ken Ward called me from Fall River, where he stood outside a restaurant awaiting an order of cod. Ken had the following to report: He and Jay were not arrested, nor even detained, by the Coast Guard or other authorities (local and state) who responded, and after some difficulty hauling up the Henry David T.'s anchor, they were allowed to leave. Ken and Jay are not aware of any charges to be brought against them, though Ken said they were told by the Coast Guard that they were vulnerable to a federal fine of $40,000 (per day) for blocking a waterway, and that they would be responsible for the cost of their removal (it was unclear what that cost might be, if any). They stayed onboard the HDT the entire time they were at anchor. The Coast Guard personnel boarded the boat, conducted a routine safety inspection, and issued a warning: the Henry David T. was apparently one foghorn short. But the lobster boat and its crew succeeded in stopping the tanker's shipment of coal to the Brayton Point Power Station, at least for one day. Full disclosure: Wen Stephenson helped launch the grassroots network 350 Massachusetts and serves on the board of Better Future Project. While Congress dallies on immigration reform, deportations rage on. Read Aura Bogado’s take.